I recently had the pleasure to view quite a few large paintings by Joan Brown which were shown at the Kayne Griffin Corcoran gallery in Los Angeles. The enamel on canvas paintings were included in the group exhibition “About Face” which was curated by Kristina Kite and Sarah Lehrer-Grainer. Joan Brown is considered a second generation member of the Bay Area Figurative movement although she shifted to an expressive aesthetic all her own. She graduated from the California School of Fine Arts (now the San Francisco Art Institute) in the 60s. She was influenced by artists Elmer Bischoff “He was the first serious, committed person I ever met in my life”, Nathan Olivera and Frank Lobdell. Brown experienced unprecedented success (especially for a woman) at a young age. Her first solo exhibit was held in New York at the Staempfli Gallery when she was only 22. 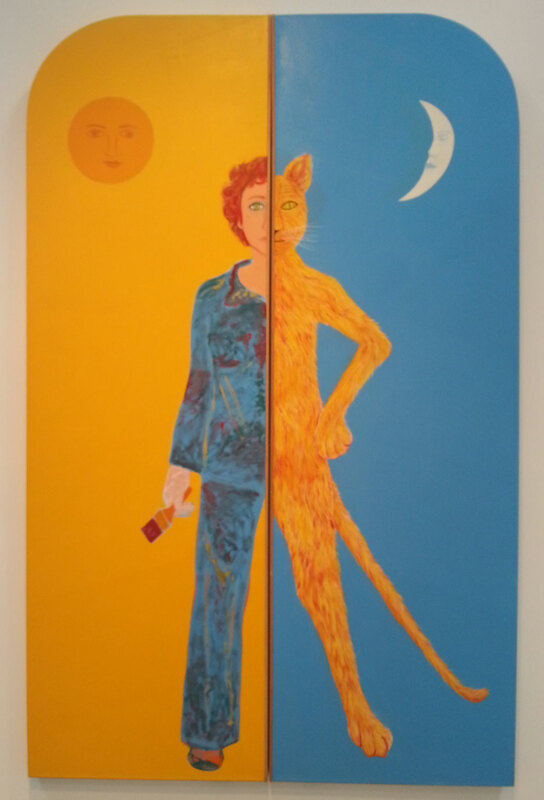 According to critic Thomas Albright “Brown became influential in New York all over again in the 1970s, with her representation in the Bad Painting show organized by Marcia Tucker for her New Museum, and in regular gallery exhibitions. These paralleled the emergence on the East Coast of New Image painting, which Brown’s early paintings had clearly anticipated, if not affected directly. Most of her paintings are autobiographical in subject matter as she painted about her extensive investigation of self and explored her roles as mother, wife, teacher, swimmer and artist. 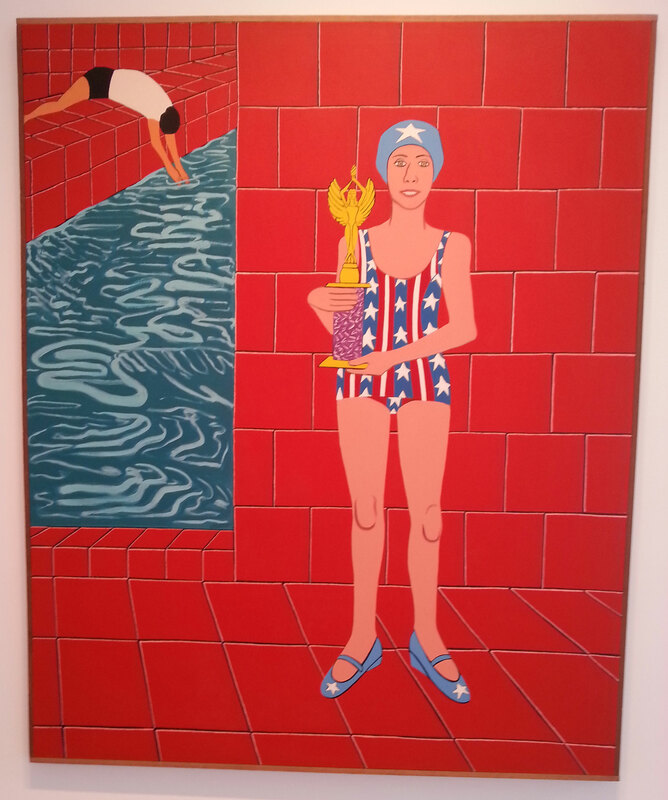 For example, the painting below “The Bicentennial Champion,” is about her successfully completing the Alcatraz swim. Her narrative stories are sometimes told through unusual subject matter such as dogs and other animals, shoes, and mementoes of travel which she renders with a whimsical touch. 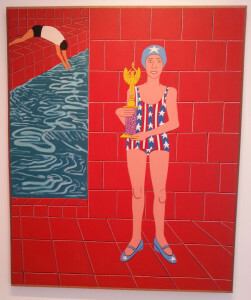 Joan Brown taught a new generation of artists at UC Berkeley from 1963 until her untimely death in 1990. She was installing an Obelisk for a commission she received at the Eternal Heritage museum in India when she was tragically killed along with two assistants when a tower at the site collapsed. Her family established the Joan Brown Estate in 1990 where more information and images can be found: www.joanbrownestate.org.